This strange word is an anglicization of an Arabic word, meaning dissimulation (which is a long word meaning telling lies). I got it from a publication I have just received from The Barnabus Fund. Patrick Sookhdeo, the Director, is a Pakistani who has converted from Islam to Christianity. Lying in Islam appears to be an anomaly. One of the 99 names of Allah is 'al-Haqq' meaning 'the reality, the supreme truth'. In the Qur'an truth is commended and lies condemned. How is it that anyone can suggest that Muslims tell lie? The doctrine of taqiyya developed from a time of religious persecution where Muslims could save their lives by concealing their true beliefs. I don't think that there is any obligation on an honorable man to tell the truth to tyrants. Thus, we would commend those brave souls who concealed allied airmen from the SS in the second world war. In the Bible Moses concealed from Pharoah his true purpose of leading the Israelites out of Egypt. Neither the SS nor Pharoah deserved to be told the truth. All well and good, but in Islam that principle has been extended so that it seems that Muslims can hardly be trusted by Christians and Jews to keep their word - the possiblity of taqiyya always exists. Obviously some Muslims are honorable men, but if many Muslims conceal the truth from Christians and Jews those many jeopardize the integrity of the many who are honest. As Hamid Enayat, a Muslim historian who was a Fellow of St Anthony's College Oxford states, "Taqiyya has in practice become the norm in public behaviour among all Muslims - both Sunni and Shi'a - whenever there is a conflict between faith and expediency." The devlopment of the doctrine was as a cloak of protection for the Shi'a minority who passed themselves off as Sunnis to protect themselves from harm. Muslim's interpret the Qur'an to say that they have a duty to save life, honor and property from danger and unlawful destruction whenever possible, even if this means dissimulation. This runs to pretended friendship with non-Muslims, a practice condemned by the Qur'an, "Let not the believers take for friends or helpers Unbelievers rather than Believers; if any do that, in nothing will there be help from God:" but there is a get out clause as it continues, "except by way of precaution that ye might guard yourselves from them." In other words pretend to be their friend as a precaution against their harming you. A famous Hadith (A Hadith was originally an oral tradition relevant to the actions and customs of the Prophet. They are meant to be a secondary source of Islam with the primary source being the Quran.) says, "Lying is allowed in only three cases: falsehood spoken by a man to his wife to please her, falsehood in war, and falsehood to put things right between people." (Al-Tirmidhi #5033: narrated by Asma', daughter of Yazid). The doctrine of taqiyya is there to defend Islam against its perceived enemies. As a conequence, much of what is said publicly by Muslim's to non-Muslims is likely to be untrue. For example, Hamid Ali, spiritual leader of the Al-Madina mosque in West Yorkshire publicly condemned the 7/7 bombings in London 2005. But in coversation with a Bagladeshi-born undercover reporter of the Sunday Times he said that the 7/7 bombings were a 'good act' and praised the bombers. This is a quote from Sheikh 'Abdul Rahman 'Abdul Khaliq, a Saudi Salafi scholar taliking about peace treaties made with Israel. The third duty is to work towards overthrowing these treaties..."
While many Muslims are honest and open in their dealings with non-Muslims the possiblity of taqiyya makes it difficult for non-Muslims to assess the relability of statements made by Muslims to them, says Sookhdeo, it si easier to be sure of what Muslims really think by checking what they say to each other and by what they do. After my illness in Canada I have decided to reassess what I am doing. As I was being driven to the hospital by Dr Ronan Foley I said to him, "If someone told me I was going to die tonight, I would say, 'Bring it on; I don't want to suffer any longer'". Of course, I wasn't anywhere near dying, just in a lot of pain, but it made me think what I was doing with my life. I am 64 and the normal retirement age is 65. My contract with the University ends in September 2008, and I think that will be time to call it a day. The weather has been beautiful today and the garden marvelous. I think I have done my stint and I ought to take time to be with my wife, enjoying things together. In a few weeks we will have been married 40 years. In that time we will have taken just 24 vacations together, and some of those have really been just long weekends. As the man says, nobody looks back and says, "I wish I'd spent more time at the office." I semi-retired four years ago; this time there will be nothing semi- about it. Before I go I have set myself three tasks. I will publish a paper explaining why 98% homology rather than 97% homology is better for the VH gene mutation cut-off. I will finish a book I am writing on CLL for doctors. I will write a book on CLL for patients. There are other things in my life to do. I should hate someone to write that CLL was all of his life on my obituary. This picture is of a fence designed to keep out illegal immigrants. We don't like fences do we? At least Javier Solana doesn't like fences. The Ceuta border fence is a separation barrier between Morocco and the Autonomous City of Ceuta, in Spain. Constructed by Spain, its stated purpose is to stop illegal immigration and smuggling. Construction of the €30-million razor wire barrier was financed by the European Union. It consists of parallel 3-metre (10-foot) fences topped with barbed wire, with regular watchposts and a road running between them to accommodate police patrols or ambulance service in case of need. Underground cables connect spotlights, noise and movement sensors, and video cameras to a central control booth. 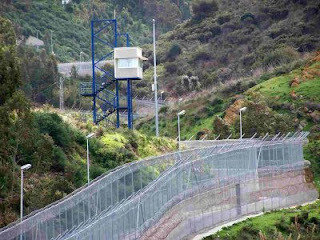 Morocco has objected to the construction of the barrier since it does not recognize Spanish sovereignty in Ceuta. Who was it who paid for the fence? Who does Mr Solano work for? Who is it that doesn't like fences? There used to be a saying in my youth, "Strong fences make good neighbors." One of the most pressing topics to come up in Canada was the usefulness or otherwise of ZAP-70 as a prognostic factor. In fact John Byrd said that patients coming to see him with their ZAP-70 assay was the bane of his life. Now I have already blogged about ZAP-70 once and my views on it have not changed. ZAP-70 is the signaling molecule for the T cell receptor. The T cells receptor is made up of several chains that protruse from the cell membrane ready to be tweaked by the target molecule which the T cell is programmed to react with. It is the zeta chain that actually reacts with ZAP-70 (which stands for Zeta Associated Protein with a molecular weight of 70 kiloDaltons). When it is twitched, ZAP-70 relays the message to the nucleus of the cell where instructions are issued for the cell to divide or secrete or whatever. In B cells ZAP-70 is not normally involved. The B cell receptor is also made up of several chains, and the one that does the signaling is called CD79b. This reacts, not with ZAP-70, but with a molecule from the same family, called syk. Syk relays the message to the nucleus in a similar way and instructions are issued for division or secretion or whatever. In CLL cells ZAP-70 is sometimes present when it shouldn't be. Even in these cells, it's still syk and not ZAP-70 that does the signaling. So what does ZAP-70 do? All signaling has an on switch and an off switch. When you think about it, there would have to be, wouldn't there? Once a signal is sent, you don't want to keep repeating the same signal do you? In fact there is an automatic damping down of the signal once it has been sent. As syk reacts with downstream molecules, compounds are formed that inhibit syk from passing any more messages for a while. What ZAP-70 does is bind to these inhibitory compounds so that syk signaling can continue unimpaired. So why is ZAP-70 there in this anomolous way? We don't know why, but we know how. Heat shock protein 90 (HSP90) acts as a molecular chaparone. It sticks close by certain moleculews and protects them from harm. It is a common feature of cancer cells that HSP90 binds to molecules that are supposed to be destroyed by natural processes and allows them to persist. ZAP-70 in some CLLs is one of these molecules with 'protection'. Why it gets this protection no-one knows. It's certainly not because it knows Tony Soprano. A trial of treatment to remove the protection is under way in San Diego. They do this with a derivative of the antibiotic geldanamycin, known as 17-AAG. The presence of ZAP-70 in some CLLs was discovered by the NIH group of Lou Staudt. After we had discovered the difference between mutated and unmutated CLLs other workers began looking for an easier assay. CD38 had proved to be only 71% concordant with VH gene mutations. The NIH group developed something they called a lymphochip (this was about the same time that FISH was getting popular and teh headline writers had fun with FISH and chips). The lymphochip allows thousands of genes to be examined at the same time for whether they are switched on or off. The glow red if on and green if off. They compared patients with mutated and unmutated VH genes - eventually using 70 of our patients for confirmation. The result was that of all the genes they examined the closest correlation was with ZAP-70. At the same time they began to look for antibodies that would detect the protein ZAP-70 in the cell rather than just the active gene. Both our lab and Montserrat's lab developed assays for ZAP-70 using flow cytometry. We presented our results at the same ASH meeting, but they were rather quicker in getting them into print - we were waiting for rather larger numbers. Both our methods were similar. There are problems with the assay. First, unlike most flow methods we were trying to detect a molecule inside the cell rather than on its surface. This means that the cell has to be made permeable to the antibody with something like paraformaldehyde. Then ZAP-70 is only one of several proteins that belong to the syk family. They are all rather alike, and an antibody made against one tends to have some reactivity against the others. Then antibodies are selected because they give a clear reaction in a particular test. When used in a different test they may not show the same characteristics. We were looking at antibodies that showed reactions by immunohistochemistry or gel diffusion or immunoprecipitation. We looked at 8 different antibodies before we found one that was both sensitive and specific by flow. The Spanish group chose a different way of expressing the results to us. The problem is that T cells and NK cells contain a lot of ZAP-70 and CLL blood has a lot of T cells and NK cells. We needed to separate the two populations, so you have to stain the T cells with anti-CD2 stained with a different color so that they appear in a different quadrant. The Spanish group used the most positive T cells as the zero, whereas we put in a negative control. Nevertheless, we got very similar results with 94% and 95% concordance with VH genes. It would be more satisfactory to use a directly labelled antibody to do the test. The Spanish group and we used a fluorescently labelled second anti-antibody to detect the presence of the primary antibody. Using a single antibody would make it easier to commercialize the test. However, when you directly labelled our antibody, you got false positive results. The San Diego group eventually produced a test using a new antibody that seems to give reproducible results, and this paper later came out in the New England Journal of Medicine. Unfortunately, the concordance with VH genes was only 77%, hardly better than CD38. What they did suggest was that patients who were mutated/ZAP-70 positive did better than those that were unmutated ZAP-70 negative, and this seems to hold now they have accumulated over 1000 cases. There is a difference, though. Our results were based on overall survival, the Rassenti results are based on length of first remission. Although, I said that a direct test would be easier to commercialize, when Quest and other labs took up the challenge, there were problems. Reports started coming back that patients were getting different results from different labs. Because of this a workshop was organized by teh journal, Cytometry B. A lot of labs partcipated, and it was clear that there was a lot of disagreement on what was important. Results were different when heparin was used as an anticoagulant compared with EDTA. How much time passed between drawing the blood and testing it was important. and there were lots of technical differences. As a result ZAP-70 testing by flow is back in the melting pot. Individual research labs are fairly sure what there own test means, but there is no comercial test that is reliable, and my advice today is don't pay good money for a ZAP-70 test. Finally, there has been a paper which tries to explain the animalous results between VH genes and ZAP-70. The Germans say that the VH mutated/ZAP-70 positive cases are the V3-21s, and the VH unmutated/ZAP-70 negative cases are thaose with p53 or ATM problems. All I can say to this is I have our examined this hypothesis in teh light of our own cases, and it does not hold water. Next time I'll look at the Falls. I've been 'off air' for some time. For those who don't know, I have been to Niagara to speak to North American CLL sufferers. The Canadian CLL group did a great job in organizing the meeting in a luxurious hotel complex at White Oaks, Niagara on the Lake. Apart from myself, the other medical speakers were John Byrd, Ronan Foley, Graeme Fraser and Susan Leclair. Bill Evans, the Chairman of Cancer at the Juravinski Cancer Centre in Hamilton gave an overview of cancer services in Ontario and Stephen Segar spoke about complementary medicine. In addition there was a patient advocacy session run by my old friend Laura Cleveland and Ryan Clarke. The Friday was mainly for doctors and the Saturday mainly for patients. I did in fact visit the Falls on the Friday morning. Since I was last there about 12 years ago there has been a lot of spending on luxury hotels and a couple of Casinos. The Falls themselves seemed unchanged. Pretty spectacular, but good for a day-trip rather than a week's vacation. All seemed to be going well until around 10 pm on the Friday when I began vomiting. I remember as a student, a consultant asked his assistant on a ward round (slyly criticizing a student's spelling), "Do you spell 'vomiting' with two 't's, Keith?" Keith replied, "Only if it is particularly severe, sir." It went on until the early hours accompanied by equally liquid diarrhea. I was weak and exhausted, hardly able to raise myself from the bathroom floor. The thing about luxury hotels is that they have telephones in the bathroom. I never knew why until now. I was able to contact the night porter, who summoned my host, Dr Foley. Don't tell his patients, but the kind Dr Foley does house calls at night. Ronan helped me back to bed, got me an anti-emetic and some fluid in the form of one of those Sports drinks that his high in electrolytes to replenish what I had lost. I slept for a while, then started bringing up the Sports drink, then slept again. I had hoped to give my second talk on the Saturday afternoon but as the day wore on I was getting worse, not better. Eventually, Dr Foley had to get me admitted to hospital for intravenous fluids. I was so dry that I could not speak. Dr Foley negotiated me through the beaurocracy of the Niagara Falls hospital. It was a smart facility, newly built (with Casino money?). The Emergency physician just happened to be someone who was at Med school with Dr Foley and my time in hospital could not have gone smoother. I was given two anti-emetics and an anti-spasmodic iv together with two liters of iv fluids and allowed back to the hotel by 9 pm. Dr Foley stayed with me the whole time. The conference organizers booked me into the hotel for another night and put all my travel arangements back 24 hours. I spent the extra time in bed. The flight home was smooth and I have been taking it easy back here in England. What caused it is anybody's guess. Was there a bug in the Niagara spray that I inhaled? Nobody else at the meeting was ill (apart from with CLL) so it is unlikely to have been the hotel food, and I did not eat anywhere else. Was it the food on the plane? Or perhaps the bar of chocolate that I purchased at Heathrow airport. Perhaps it was a virus? I have lost 8 pounds. Every silver lining comes wrapped in a cloud. The Canadians were great hosts. Anyone can entertain a visiting speaker. It takes special qualities to care for a sick one. So they were. Nazism was extremely popular in Germany in the 1930s. The attractive presentational style disguised the horror of the content. We are very prone to confuse style and content. Very beautiful people, darlings of the media, do terrible deeds and ugly people go around doing good. It was crass mismanagement to get captured in the first place. This is the second time that the Iranians have picked up hostages from Royal Navy personnel trying to intercept smugglers. Such missions must be conducted with sufficient force, and especially with enough helicopters. Britain is trying to carry on a war on two fronts – Iraq and Afghanistan – with insufficient men and inadequate arms. Since it is the duty of the Minister of Defence to provide for his troops it is the Minister of Defence who must fall on his sword when mishaps like this occur. Worse was to follow. The hostages were given permission to sell their stories to the highest bidder, in an attempt to counter the lying propaganda from Iran about how well they had been treated (they were captured in Iraqi waters by an act of piracy and far from being an act of generosity by the Iranian politicians, their release was a face-saving exercise when the Iranians came under international pressure). A sympathetic eye might regard this as a naïve attempt to influence the media by young civil servants, until we learn that the decision was made by the second Sea Lord, and that Des Browne was not around to approve it because he had left early before his Easter break – a habit that was not his alone, but commonplace in government offices and seen as a perk. I don’t suppose he will be paying back his salary for the half day that he didn’t work. So Des Browne should go, but the guilt wasn’t his alone. Why were they short of helicopters? You can do a lot without helicopters as this report from Basra demonstrates but if you read the comments that follow a recurring question is: why did they have to do it without helicopter cover? The answer seems to be in the hands of Mr Browne’s namesake Gordon Brown., the man most likely to be our next Prime Minister. He has a reputation for sound financial management, but it may be that he has happened to be in charge through a period of long standing house-price inflation, which has put money without cost into the back-pocket of electors. This may keep the country happy for a while, but while many people are individually richer, money has not been spent where it needed to be. In today’s modern warfare that means helicopters. I heard yesterday of a company that sells luxury items. They buy a particular item from their wholesalers for £3, put their own label on it and sell it for £75. You pay £72 for the label. Why don’t people buy direct from the wholesalers? Because it's the label they want. The label that says, “World beating armed forces” isn’t cheap to print and can’t be bought by cheap media tricks. It is acquired through the blood and guts of brave young men and women. As we leaned in the First World War, it’s easily lost when they are led by donkeys. Banking for the rich alone. There has been a furore in Canford Cliffs because the local branch of HSBC bank is in future to provide a counter service only for customers who make use of their Premier service. To do this you must have £50,000 in savings or a £200,000 mortgage or a salary in excess of £75,000. Canford Cliffs is the expensive part of Bournemouth (to be accurate it is part of next-door Poole). This branch serves Canford Cliffs, Branksome Park and Sandbanks, the most affluent part of our conurbation. Most people who live there are millionaires. There are some retired folk who are living on a fixed pension who are property-rich but income-poor. Now I don't see the problem. Nobody would expect the Rolls Royce showroom which is next door but one to stock Fords for the less well off. If a bank wants to provide a service for its rich customers why should it not? It's not as though it is the only bank in the village; there is a LLoyds bank just across the street. Message to poorer HSBC customers. Change your bank. It's called competition and without it capitalism doesn't work. When should a CLL patient have a CT scan? The first thing to say is that for the past 30 years the staging of CLL has been carried out very satisfactorily without CT scans. Indeed all the predictive information that is based on Rai or Binet staging specifically excludes CT scanning. However, it stands to reason that some Rai stage 0 patients will in fact have enlarged retroperitoneal lymph nodes (this means nodes at the back of the tummy)undetectable by clinical examination, and these patients will have the prognosis of stage I patients rather than stage 0 patients, and that in some patients the glands will be of sufficient size as to justify immediate treatment. If CT scanning is used to stage patients, then patients who are truly stage 0 will have a better prognosis than historical data shows, but we are in the dark about what happens to patients whose only evidence of enlarged lymph nodes is what is detectable by CT scanning. A new paper from Professor Montserrat's group is about to be published in J C lin Oncol which helps to resolve this. The Barcelona group did abdominal CT scan on 140 stage 0 patients. 27% had an abnormal CT scan. This correlated with increased bone marrow infiltration, high lymphocyte count, high ZAP-70 expression and short lymphocyte doubling time. Patients with an abnormal CT scan had a shorter time to first treatment than those with normal CT scans (median 3.5 years compared with median not yet reached). In a multivariate analysis only abnormal CT scan and high ZAP-70 correlated with disease progression. (Remember that the Barcelona ZAP-70 is one we believe in - it was published in NEJM under Crespo et al. It correlates very closely with unmutated VH genes). In the light of this finding the International Working Group in CLL are minded to add to their advice on the management of CLL. CT scans generally are not required for the initial evaluation, staging, or follow up. A recent study has found that patients in Rai stage 0 but with detectable abdominal disease by CT scans may have a more aggressive disease. Therefore, clinical studies evaluating the use of CT scans in CLL are strongly encouraged. The IWCLL group are very conservative about changing recommendations, but I certainly think that there are situations where a CT scan would be indicated in the initial evaluation of patients in clinical practice. Patients who are apparently stage 0 but have a lymphocyte count greater than 50,000 (possibly those greater than 30,000), overweight patients who are difficult to examine for lymph nodes, patients with 'B' symptoms, patients with lymphocyte doubling times of less than a year, patients with unmutated VH genes (or a reliable positive ZAP-70). I know that some people who are worried by the radiation dose from a CT scan. This worry has been reinforced by an MRI specialist who has been writing on Medscape. I have to say that this is very much a lone view among medical imagers. Most, while recognizing that CT scanning does involve a large dose of radiation compared to that received from a chest X-ray, nevertheless agree that the risk of inducing a second cancer is very small compared to the risk of missing the correct diagnosis. What about using ultrasound or MRI to diagnose retroperitoneal lymph nodes? In some countries, the use of abdominal ultrasound is popular to assess the extent of lymphadenopathy and organomegaly in CLL. While it may be used in the clinical management of individual patients, this methodology is strongly investigator-dependent and should therefore not be used for the response evaluation in clinical trials. - so say IWCLL and I agree with them. Measurement of nodes on successive ultrasound scans is nigh on impossible, because you cannot really produce comparable views. Similarly, the IWCLL view of MRI is this - "nuclear magnetic resonance imaging and other imaging techniques are generally not useful in the management of CLL." Again I agree, the view of lymph nodes is not precise enough. While we are on the subject of imaging, the IWCLL say, "Positron emission tomography (PET) scans do not provide information that is useful in the management of CLL. PET scans, however, might become useful in the diagnostic evaluation and follow up of known or suspected Richter's transformation." In clinical trials, the latest German trials demonstrate that the use of CT scans to evaluate how good a response is, is very worthwhile. Apparent complete remissions are nothing of the sort in many cases when CT scans are used to evaluate them. The IWCLL recommend, "In clinical trials where the treatment intent is to maximize complete remissions, neck, chest, abdominal and pelvic CT scans are recommended to evaluate the response to therapy. CT scans should be performed prior to the start of therapy and at the first restaging following therapy if previously abnormal". Like all imaging examinations the doctor must first ask himselftheh question, "Why am I doing this?" and then answer the question, "How will it alter my management if I have this information?" If the answer to the first is, "Idon't know or because it is in the protocol" or the answer to the second is "Not at all or I don't know," then the CT scan should not be done. I have been asked to write a second stanza for LeBlanc and Baloche's well known hymn, to take it past the crucifixion so as to tell the whole Easter story. Here's what I came up with in the wee small hours of trying to adjust back to European time. You have conquered death and all its power. Psalm 14 is almost identical to Psalm 53. In David's day atheists were thin on the ground and it is not the man who believes that there is no God that the psalmist is referring to. The Hebrew word translated as 'fool' means more than mentally deficient; it means someone who is morally deficient. Like the chap is Psalm 10 who says to himself, "God has forgotten. He covers His face and never sees." David is talking about the practical atheist. In all his thoughts there is no room for God. His ways are always prosperous; he is haughty and God's ways are far from him. He says to himself, "Nothing will shake me. I will always be happy and never have trouble." Do you recognize this modern man? Because Psalm 14 tells us that when God looks down on the world he finds that all have turned aside and have together become corrupt. There is no-one who does good, not even one. How redolent that is of the New Testament. In his letter to the Romans, St Paul quotes from this very psalm. The classic text that demonstrates a universal need of a Saviour is Romans 3:23. "For all have sinned and fallen short of the glory of God." Evildoers frustrate the plans of the poor, says David in Psalm 14. They revile God with the taunt, "He won't call me to account". But God's forebearance will not last forever. David calls for the salvation of Israel to come out of Zion. And so it did, for those very ones who have fallen short are "justified freely by his grace through the redemption that came in Christ Jesus God presented him as a sacrifice of atonement through faith in his blood. He did this to demonstrate his justice because in his forebearance he had left the sins committed beforehand unpunished - he did it to demonstrate his justice at the present time, so as to be just and the one who justifies those who have faith in Jesus." This great grace is available to all but limited to those with faith in Jesus. This great doctrine is substitutionary atonement. Christ died for the sins of the world. Sins remain unpunished for a while because God punishes them in Christ. Those who refuse his offer must pay their bills themselves. Substitutionary atonement is one of the core beliefs of Christians. Mel Gibson’s film may have been flawed but it attempted to demonstrate how foul, vile and evil was Christ’s crucifixion. How could God subject anyone to that sort of death unless it was absolutely necessary? He subjected not just anyone but his own completely innocent son to that horror. And Christian doctrine holds and the Bible teaches that father and son are one. As Jesus suffered so suffered God the father. I don’t suppose I am unique in having a sense of justice. If I see wicked men set free without punishment for their crimes then I am outraged. For the guilty to go free, someone must pay the price. What is truth? said jesting Pilate; and would not stay for an answer. So wrote Francis Bacon in the 16th Century, quoting from St John's Gospel. Pilate was responding to Jesus' assertion "I came into the world to testify to the truth. Everyone on the side of truth listens to me." A primary school teacher, an engineer and an accountant each answered the question, "What is the sum of 2 plus 2?" The engineer was more specific, "If by two, you mean 2.00, then the answer is 4.00, but if your twos are really 2.28s rounded down to 2 to zero decimal places, then the correct answer is five, or 4.56 rounded up to 5." The accountant was worldly-wise, "How much would you like it to be?" I have been thinking about truth ever since reading a book called 'Freakonomics' by Steven Levitt and Stephen Dubner. This book hit the headlines when it made the astonishing claim that the falling crime rate in America was a direct consequence of Roe v Wade. Freakonomics is about challenging the conventional wisdom. Between 1975 and 1990 violent crime in America had risen by 80%. Experts were predicting a bloodbath. Fueled by crack cocaine, the black areas of inner cities were exploding. Then in the nineties it all began to go away. Crime levels have fallen back to the levels of 1960. Why? There have many suggestions: The 'broken windows' approach to inner city policing introduced by Rudolph Giuliani and his police commissioner, William Bratton, in New York City has gotten a lot of the credit, but so has simply putting more police on the streets. Tougher gun-control laws, gun buy-back schemes, laws against concealed weapons, all have their advocates. Or is it simply a strong economy cutting down the numbers of unemployed? The devil makes work for idle hands. Is harsher punishment acting as a deterrent - longer prison sentences or the return of capital punishment? Or is it a change in the market for crack? Or simply the greying of the population? Levitt and Dubner have considered all these possibilities. About a third of the decrease comes from locking up criminals. Prisons are expensive, they often brutalize the inmates, and often it is the inadequate, the addict and the mad that are locked up, but there is no getting away from it; career criminals commit no crime when incarcerated. On the other hand capital punishment, as it is practised, makes little difference. The truth is it turns out to be safer for a criminal on death row than it is selling crack on a street corner in Chicago. He is less likely to die. Criminals didn't march to jail by themselves; someone had to put them there. Homicide rates in New York City fell from 30.7 per 100,000 in 1990 to 8.4 per 100,000 in 2000. However, the fall began before the broken windows strategy began. It began when the previous Mayor, David Dinkins, started increasing police numbers in response to Mayoral contender Guiliani's law and order campaign, four years before 'broken windows' was instituted. In fact the homicide rate fell in other cities that increased their police numbers and didn't adopt the Bratton philosophy of policing. Increased police numbers accounts for about 10% of the drop in crime; less unemployement on the other hand cannot be responsible for more than 1% or 2% of the total fall. Tougher gun laws have had little effect. Indeed, in Britain where all hand guns are banned, gun crime is increasing. Surprisingly, criminals don't obey gun control laws any more than they obey the laws of property. More important was the fall in the price of crack cocaine. Most of the inner city murders were not by crackheads but part of the intense competition for prime selling sites. Gang member shot gang member. These were turf wars. The use of crack has not diminished since 1990. The supply has become more available, but roughly the same number of users are able to obtain more for their money. The profits have diminished, the street corners aren't so valuable and not worth dying for. The change in the crack economy accounts for 15% of the fall in crime. The greying of the population accounts for the rest - about 40% of the fall. On the whole the over-65s tend not to commit violent crimes. But why are there fewer young people? Obviously contaception is part of it, but abortion available to all is the major component. Every year in America over one and a half milion babies are aborted. By and large these are the children of the young, unemployed, unmarried, inner city poor. These are the characteristics of those most likely to become criminals. Unintentionally, America has been aborting its potential criminals. Lies, damned lies and statistics! Statistics are notoriously misused to mislead. Levitt and Dubner's assertion received a bad response from those on both sides of the abortion debate. However, the figures seem to me to be true. The greatest contribution to the fall in crime in America is the fall in the number of those likely to become criminals and the reason for this is the increased availability of abortion. Since Roe v Wade conceptions have risen by 30% but live births have fallen by 6%. Consider this. Had the American government, as a solution to the crime wave, brought in a law that ordered the killing of a large proportion of babies born to unmarried, teenage, black mothers who were poor and unemployed, the world would rightly have been in uproar. Headlines would have screamed George W Herod (or William J Herod - take your pick). Instead, women of America have freely chosed to abort these babies before they were born. Try as I might I have difficulty in seeing a fundamental difference between killing a developing fetus and killing a newborn. I know that a certain proportion of fetuses will not reach term, but nobody is concerned about them; the reason for an abortion is to kill the fetus that will come to term. I know about a woman's right to choose, but that presupposes that she harms no-one but herself. It presupposes that the developing fetus is not an individual in its own right. When does it become an individual? At 8 weeks or 13 weeks or 24 weeks or 28 weeks or when it is born or when it begins to talk? Legislation in the UK forbids experimentaion on an embryo after 14 days, when the primitive neural streak appears. As a man I struggle with this area. To bear a child is a particularly female thing; no man can begin to understand the intimate relationship between a mother and child. Of course there is a difference between killing a fetus and killing a baby. It is an esthetic difference; it is an emotional difference; but is it an ethical difference? And should we beguided by ethics or esthetics or emotions? I suspect that I will have responses from both sides of the debate. I have my views, but I'm not calling anyone by a rude name. Please refrain from calling me by one. However, the debate is enhanced by facts that allow us see clearly what is actually happening. If you haven't read Freakonomics than I recommend that you do. There are other topics like why do drug dealers live with their mothers, and how you detect a cheating Sumo wrestler. And the next time you move house or sell your car you might want to ponder on the power of experts to rig the market against you.